Home » Quarta news » Practical use of RD1212 Geiger Counter: radioactive iodine therapy for thyroid cancer. A journalist from Vancouver was traveling across the South Pacific on vacation. The journalist was a curious and suspicious man so he brought an RD1212 Advanced geiger counter. After all, he presumed that exotic places may have exotic dangers, a lucky foresight on his part. 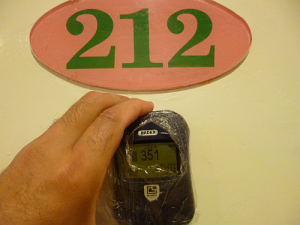 When staying at a fine hotel and resting in his suite after a long excursion he pulled his geiger counter out of duffel-bag and turned it on. Imagine his real shock when the device almost immediately started chirping like crazy, with the measurement scale on the screen jumping to heights of more than a hundred-times what is considered a reasonably safe level of radiation! This was happening in a modern hi-rise hotel, in an isolated room being reasonably far from anything industrial or even remotely suggestive of radiation. How? Why? When the initial shock subsided, the man took an exploratory walk across his suite and out into the hall, his eyes fixated on the abnormally high numbers still fluctuating on the little digital screen in his hand. “Beep-beep-beeeep!” Expected normal levels tend to be circa 0.30 micro-sieverts per hour, meanwhile the readings coming in were in the upper 90s. This was very, border-line catastrophe high! Quickly realizing that the geiger counter was reacting to a presumable distance from a source, the journalist established the direction of where the highest readings were emanating from and soon he was knocking feverishly on the door to the neighboring suite. A man opened up, with his throat wrapped in bandages. The radioactive iodine (RAI), also known as I-131 taken into the body in liquid or capsule form, it concentrates in thyroid cells. The radiation can destroy the thyroid gland and any other thyroid cells (including cancer cells) that take up iodine, with little effect on the rest of your body. This treatment can be used to destroy any thyroid tissue not removed by surgery or to treat some types of thyroid cancer that have spread to lymph nodes and other parts of the body. While the treatment is ongoing and even several weeks afterwards, the patient is a source of considerable levels of dangerous, ionized radiation. His condition can potentially cause real harm to his family or pets, with special danger posed to young children and infants. High accuracy radiation detectors can be exceptionally useful in such cases of post-Radioactive iodine therapy, when a patient is back home with their family. The radiation slowly wears off once the procedures are concluded, but it can take weeks. 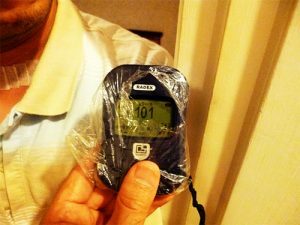 Having a sensitive, properly calibrated geiger counter, especially with lab-level quartz sensors will establish the levels of dangerous radiation and help in planning interaction and living arrangements accordingly. As for the journalist, he later wrote to us thanking for the high-grade scientific gieiger counter that was so sensitive as to pick up radiation from another room and to determine where it was coming from.He has also switched rooms in the hotel and was extremely grateful for not spending the night with his head to the wall, right next to one hundred micro-sieverts per hour of ionized radiation. If you have any questions about RADEX high accuracy Geiger Counters, please feel free to contact us with any questions. We are located in New Jersey and we are happy to help!